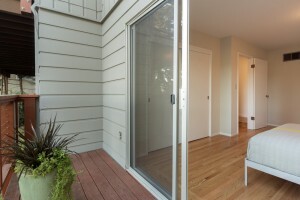 Are your old sliding doors constantly getting stuck? Or perhaps you’re interested in adding a custom-built patio to your Durham, NC home and are looking for a highly recommended product. Either way, Gerald Jones Company has an industry favorite to share with our valued customers: Prestige Vinyl Sliding Patio Doors from ProVia. Vinyl interior trim and exterior brickmold for a clean, finished appearance. Internal blinds mean no more dusting and can be tilted, raised and lowered with convenient fingertip slides. Patented sliding system ensures quiet, smooth and easy operation with four adjustable 1” wheels per panel. Top-hung, heavy duty aluminum screen frame suspended by ball bearing rollers reduces binding, keeps the track clear of debris and makes operation effortless. Energy Star qualified design increases energy efficiency by lowering your heating and air conditioning costs. Lifetime Limited Warranty against glass breakage and seal failure. Top of the line industry ratings for air and water infiltration, wind load resistance and forced entry prevention. Sometimes, you just have to see it to believe it. If this is the case for you, come into our home improvement showroom in Durham, and one of our friendly representatives will be happy to show you the Prestige Vinyl Sliding Patio Doors. For these and any other patio or custom building related questions you may have, feel free to contact Gerald Jones Company at (919) 286-1700. With over 60 years of experience in the home improvement industry, our family owned and operated business has the knowledge and resources to help with your custom home building needs. This entry was written by geraldjones, posted on April 13, 2015 at 7:40 am, filed under Uncategorized. Bookmark the permalink. Follow any comments here with the RSS feed for this post. Both comments and trackbacks are currently closed.